Well, here we are. GIB has finally let loose with the 2013 version of their Cascadian Dark Ale, the 2012 version of which started the whole CascadiaGate issue. Or, at least, that’s Steamworks’ story and they’re sticking with it. For their part, Steamworks has since announced that everything is fine, and they realized the errors of their ways. Anyone can use “Cascadia” in the style of a beer, just so long as they don’t use it as the name (then they’ll have to pay $1). But I digress, this is not a story anyone even remotely familiar with beer in BC is not completely sick of. Kind of like our overly restrictive beer laws. What? Those are still here? Crap. 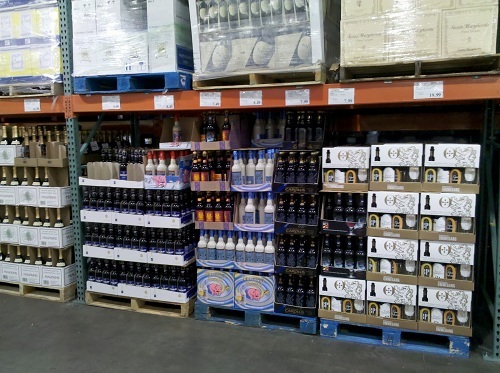 Pictured: Great beer in Costco. This is a thing that happens elsewhere in the world. GIB also took the opportunity to relaunch their Limited Release Series as the Black Book Series. The beers themselves will be familiar versions of Brewmaster Vern Lambourne’s brews of years past, but they will have funky new labels and, for the first time, names. Cloak and Dagger is a Cascadian Dark Ale, and all CDAs tend to be good, but it lacks that massive hop punch that trademarks the style. In fact, this is somewhat of a sweet ale… with an approachable taste, and that’s my main issue. CDAs are a beer nerd’s nerdy beer, and this just isn’t that. Sure, it has some of the toasted malt we all like in our CDAs, but that’s about it. SHOULD I BUY IT? Depends. Do you like sweeter, maltier IPAs? Then yes. Otherwise, give it a skip. Lawsuit odds I’ll give you 4:1. I just don’t see them doing it. Cost $? per 650ml bottle (free sample). Subscribe to comments with RSS or TrackBack to 'Granville Island Cloak and Dagger'. Most American girls are fat, slutty feminists who dress like slobs. Men should boycott them to encourage them to improve and start putting them in their place. 2. When you are near a fat chick, use your mobile phone by pretending that you are talking to a friend and complain loudly about how disgusting fatties are. Thank you Pat Lee. That has to be comment of the year. Um…. anyone else wanna take a stab at this one? Cuz, honestly, I’m at a loss. I mean, I’m pretty sure it’s spam, but I have no idea what they’re selling.